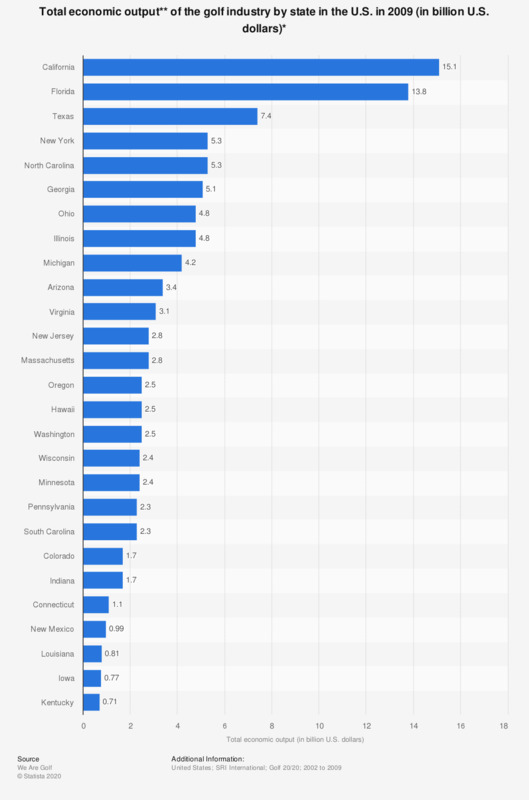 This graph depicts the total economic output of the golf industry in the U.S. by state as of 2009. In New Mexico, the total economic output was at 985 million U.S. dollars in 2006. ** Total economic output is defined as the direct economic output combined with the indirect economic output (includes revenue generated from the purchase of goods and services from other companies by golf course facilities and the companies that provide goods and services to the golf industry) as well as the induced economic output (includes economic impact from employees directly employed by the golf sector who will spend much of their income in the region therby creating more spending and more jobs in the local economy).